It’s not even the end of November yet but the sweet smells of the holidays are in the air already. We’re slowly tiptoeing into the upcoming holiday meal preparations, planning menus and considering dishes and decorations. The thought of coming in from the crisp air outside to a warm house filled with the scents of the season makes my heart happy. But apart from big celebratory dinners, this time of year is tailor made for spending chilly afternoons snuggled up with a nice cup of tea and a slice of something sweet. I suggest a chocolate covered date caramel and walnut tart and a cup of Chai tea; they keep good company. 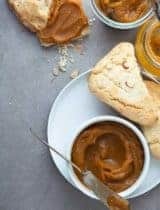 Rest assured however that it’s just as home on any holiday spread if you’re looking for a holiday dessert that breaks from the pumpkin or pecan variety. 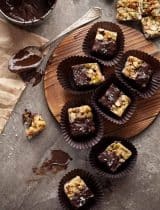 A classic combination of tender shortbread crust and a soft caramel-like filling is topped with a rich chocolate ganache and finished with a scattering of walnuts. 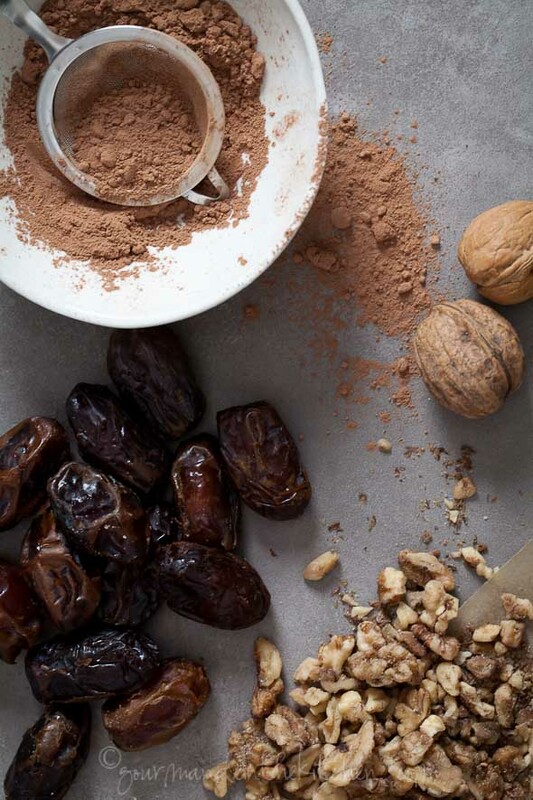 The sturdy cookie-like crust made from almond flour and coconut oil is filled with a walnut studded date paste and a hint of salt with flavors reminiscent of caramel and brown sugar. It’s a combination sure to delight any chocolate and caramel lover. Large tender Medjool dates provide the sweetness in the filling and offer a luxurious toffee-like complexity to the base of this tart when paired with a hint of sea salt and fresh vanilla bean. 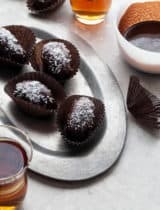 The dark chocolate ganache that blankets the cookie crust and caramel base is made with anti-oxidant rich raw cacao powder and maple syrup and is a silky and intense counterpoint to the sweetness of the date caramel. Here’s to the start of the holidays! What are you making this year? 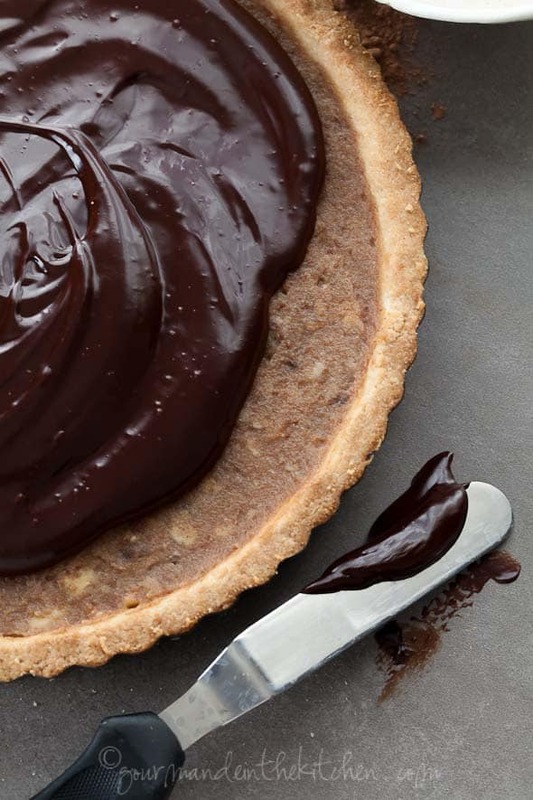 A sturdy cookie-like crust made from almond flour and coconut oil is filled with a walnut studded caramel date paste and topped with a silky raw cacao ganache. Grease a 9 inch tart pan with a removable bottom. Place almond flour and salt into a large bowl. Add maple syrup and melted coconut oil and blend together with a fork until it resembles coarse meal, about two minutes. 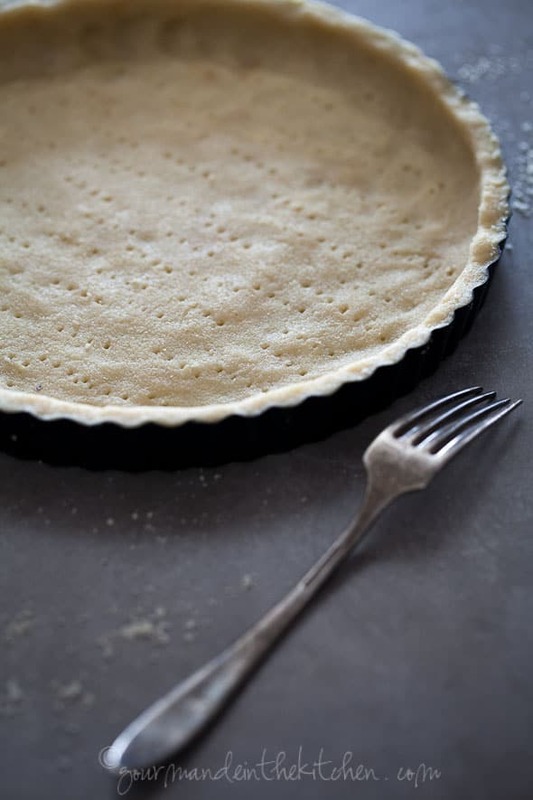 Press firmly and evenly into the bottom and sides of tart pan with your fingers. Prick with the tines of a fork. Let the dough firm and chill in the fridge for at least 20 minutes before baking. Preheat oven to 350 F. Bake for 15-18 minutes, or until golden but not dark. Remove from oven and set aside to cool while making filling. In a food processor puree the soaked, pitted dates along with the soaking liquid, melted coconut oil, salt and scraped vanilla bean seeds until thick with a whipped, creamy texture is achieved. Stir in ¾ cup of the chopped toasted walnuts and spread mixture into the cooled tart shell in an even layer. Set in the fridge while making the cacao ganache. In the food processor, blend together maple syrup and melted coconut oil until well combined. Add in cacao powder and process until smooth scraping down the sides as needed. Pour over date walnut base and spread out evenly over the top. Sprinkle with extra seal salt and the remaining chopped toasted walnuts. Return pan to fridge to set and firm for at least one hour before serving. NOTE: You can use a 9-inch pie plate if you don't have a tart pan with a removable bottom. Wow Sylvie! I'm loving this especially because it's processed sugar free too! And aren't coconut oil and cacao just amazing ingredients! So healthy and versatile. Great shots! It's stunning! I just made a chocolate cake with dates and when I was formulating it, really wanted to make a tart. I love this tart of yours! And that you kept it vegan, GF, wow, amazing job! This is gorgeous! What an awesome idea! wow Sylvie it's GORGEOUS and my mouth is watering for a big slice!! Thanks for linking up! This looks amazing Sylvie! I am adding this to my holiday menu! Sylvie, I'm afraid I would eat the whole thing myself in one sitting! YUM! This looks so amazingly rich and decadent--I would never, ever guess that it's healthy! Gorgeous, Sylvie!! Love the shortbread crust!! Tart... get in my BELLY! This is a must try. 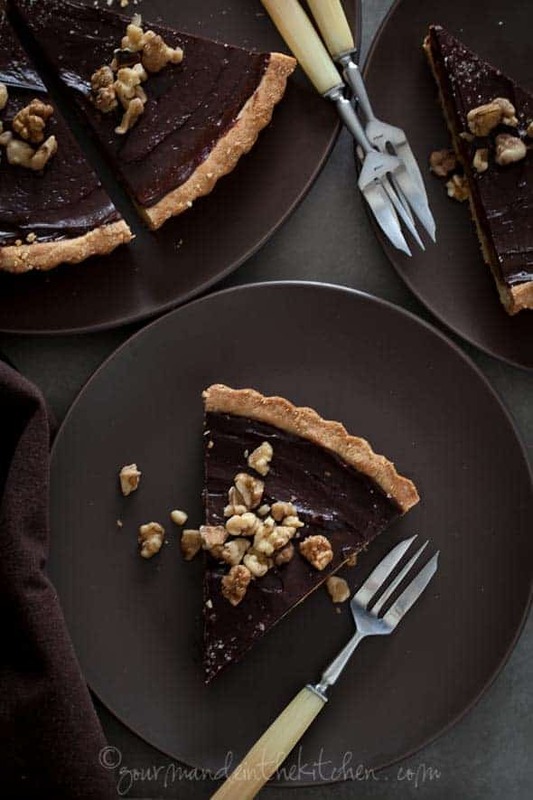 Beautiful tart, the ganache looks irresistible! Oh yes I'd certainly like to take refuge from the cold with a slice of your tart and a cup of tea. It looks amazing Sylvie. What fantastically beautiful photos. That first dark-on-dark one is really impressive! This is beautiful! 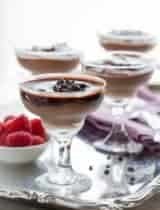 I am so amazed by gorgeous healthy creating every time :) It always looks perfectly decadent. Wow, that tart is amazing and beautiful and still full of healthy ingredients! Oh my word! This is so decadent and yet is free from gluten and processed sugar, how amazing. Thank you so much for all your wonderful recipes that turn our gluten free lives into something special. OH MY! I just want to dig in right now. And it also sounds healthy. This recipe makes me so happy! I won't modify a thing - awesome dairy-free, grain-free ingredient line-up! Oh my, talk about droolworthy photos. I need to cook dinner but all I want is a piece of that tart. I think the word I'd use to describe it is luxurious. What am I making for the holidays this year! Definitely this yum vegan chocolate tart!!! :) Thanks for the recipe, Sylvie! 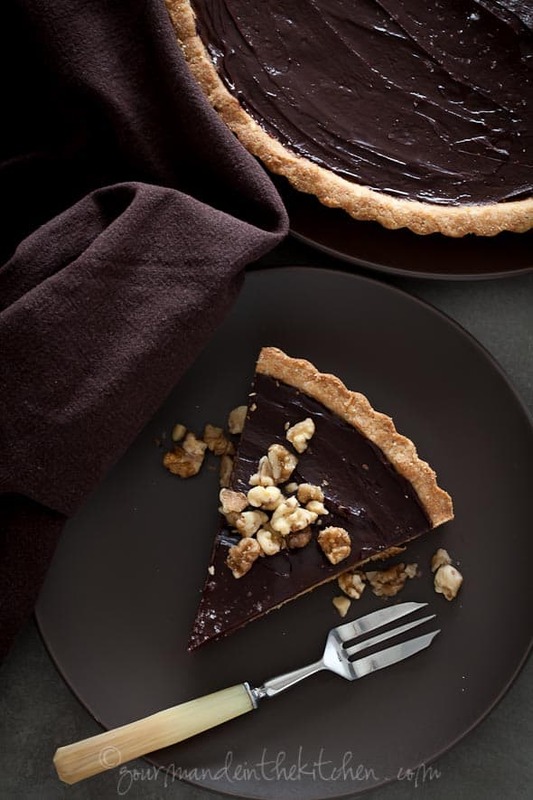 Walnuts and dates..and a gorgeous tart...Hmm..I am craving for a slice now! Just stunning, Sylvie!!! And such an ingenious way to add caramel flavor without butter and sugar...well done!!! This tart looks wonderful Sylvie. I've developed two gluten free recipes this week - one is for a friend who can't eat eggs either but next time I bake for him I'm making this! Dates add such a gorgeous caramel flavour but naturally, such a lovely ingredient. It would be impossible to have just one slice, it looks amazing! That looks fantastic! I love your chocolate tart. What a beautiful tart Sylvie - and I just love how this is GF/DF/Vegan! mmm, i love almond flour! great recipe - totally mouth-watering! Every time I visit your site I am stunned by the beauty of it all! This tart is no exception - just gorgeous, Sylvie!! I love the date and chocolate combo. Lovely flavors as always Sylvie. Save me a piece? That does look stunning. I am itching to make something using mejool dates as the sweetener and thickener. As you have hardly tasted okra, I have actually rarely tasted a date! I imagine the texture would be wonderful in desserts. Happy Thanksgiving planning to you! I've had this window open for the last couple of days and totally meant to comment because this looks like one of the most wonderful tarts. So lovely! with all these flavors going on, I can only imagine (for now) how insane this must taste. wow. gorgeous photos too! Seriously? How can you tempt so - chocolates and dates in one tart - all my favorite things in a luscious dessert! I'm so happy to hear that thank you, glad you all enjoyed it! Gorgeous! 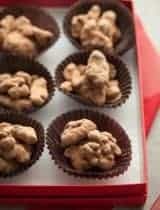 I love date truffles, so a whole tart I know would be mind blowing! 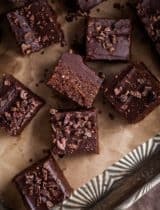 I've got a few friends who are either vegan and gluten free or paleo, so this is the perfect thing to make for everyone to share. Thanks for the recipe! Such a delicious looking tart Sylvie! Such a stunner of a tart .. glamorous and conscious!! Gorgeous as always, Sylvie and I am so intrigued by the date-chocolate flavor combination! Very original and too pretty! 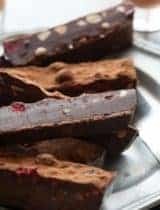 Hi Laura, You are right that should have read 250 grams/ 2 cups not one, I apologize for the mistake I have updated the recipe now to reflect that change. I am really glad everyone enjoyed the dessert, that always makes my day when I hear that! This is one of the most decedent and stunning looking tarts I have ever seen! 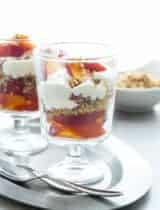 I just came across your site while looking at a different recipe, but am I sure glad I saw this! It looks insane!! Can't wait to try it! How in the world am I just seeing this tart now? Amazing! I am getting ready to toast some walnuts for my beet salad, but definitely need to save some for your fabulous creation! That just sounds wonderful! Can't wait to try. Thanks for sharing such a great recipe! Just made this and it looks amazing! This recipe is divine! I made it for New Year's Eve and it was a big hit. So good, I'm making it again tomorrow. Brilliant! I added some red chile powder to the chocolate ganache and it was amazing. Hi Elle, I'm glad you liked it! Yes my dates were pretty jumbo sized so the weight is a more accurate measurement. Hi Nicole, I'm not sure why it would be sticking but maybe your pan could use a little extra greasing? Also try running a knife along the edges to loosen it a bit before unmolding it as well and see if that helps. I don't think the extra time in the fridge is the culprit, that should actually help firm it up and make it easier. This was absolutely incredible - made it for a bday for a friend and everyone LOVED it! I used a cup of hazelnut flour mixed with almond flour for the base. That gave it a nice texture. Next time I might reduce the maple syrup a bit in the ganache - it was sweet enough - but the group that ate it said, no way, perfect as is. Thank you soooooo much for this recipe! You're so welcome, I'm glad that everyone enjoyed it! These tart is gorgeous! Can't wait to try my hands on - health and tempting! Heavenly! I made this with one change .... I soaked the dates in spiced rum .... omg .... this is a keeper! Absolutely stunning and I just adore dates! What a gorgeous dessert for a celebratory/holiday dinner.. So incredibly beautiful! I am always blown away but your delicious photos! I could dive right into this one. Hi Caroline, You can make it a day or two ahead of time and then refrigerate it if you'd like. This sounds delicious!!! I'm all for chocolate! Can this be made a night ahead? I'm planning on making it for our Christmas dinner but want to save some time in the kitchen! Yes you can make it the night before. I hope you enjoy it!